This weekend is the Third Sunday of Easter. The readings can be found here. The Gospel contains the wonderful story of the Road to Emmaus in the Gospel of Luke. Two disciples were walking with the risen Christ but did not recognize him. This story has deep symbolism and meaning in my own life. For most of my early adulthood, I was walking in the Divine Milieu but elected to ignore the presence of God around me in other people, in nature, in the calling of my innermost desires. I was too busy focusing on career and individual “success” that I was blind to God walking next to me. “When Charles Darwin was confidently working out the details of his theory of evolution, he recorded in a moment of wonder, that of all the organic phenomena in the natural world, the development of eyesight in mammals and humans was the one thing that troubled him most. He was at a loss to adequately explain the origins of the sense of sight from a scientific point of view. The idea of an organism being able to perceive the world visually did not fit neatly into any schema of biological development. It seemed to him, almost miraculous and reading Darwin’s own writings on the subject, one realizes that this was one dilemma that became a real challenge to his own atheism. Even now, some scientists find the phenomena of eyesight the most incredible achievement of our biological development. But long before Darwin, thinkers and philosophers have been questioning, not just the wonder of eyesight, but the deeper significance of the act of seeing. The Greek philosopher Anaxagoras declared that we were “born for seeing”. And just over 2000 years later, that great priest, theologian and scientist, Pierre Teilhard de Chardin said that all life is comprehended within seeing and that the whole evolution of the cosmos aims above all at “the elaboration of ever more perfect eyes”. It is eyesight – the act of seeing – that is one of the biological faculties that makes us fundamentally human, but we have come to understand that seeing is much more than a mere biological function of a sentient body. It seems that in order to truly know ourselves, our existence and our deepest yearnings, we humans are always craving some form of understanding through seeing. In our world we have so much but we see so little. Certainly, we spend at lot of time looking at a great many things, but do we really see? In other words, we often have the experience but do we really get the meaning? 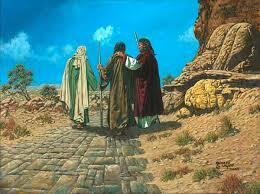 The Emmaus story is very much a story about not seeing and seeing. We are told that while two of the disciples are walking and discussing recent events, Jesus was suddenly walking and talking with them, but they didn’t see that it was Jesus. Luke tells us: “There eyes were kept from recognising him”. And later, when they sat to eat with him, “Their eyes were opened” and then they recognised him, but suddenly he vanishes from their sight! Luke is the only evangelist who gives us this account and we may wonder why. Taken literally, this is all strange and for some it is difficult to swallow. Why did it take the disciples so long to recognize Jesus? It seems that Luke is trying to say something important about resurrection; how the disciples are to understand Jesus Christ’s presence in the world, and the joy that comes with that understanding. If they are to see Christ, they are to see him differently. It is not a bodily Christ they must seek or expect to find anymore. Christ must now be discovered dispersed into the world. This gospel passage should lead us to some profound insights about seeing and understanding. We too are like those first disciples. We seek to discover Christ – we seek the presence of the divine, but much of the time we do make that connection. But we can empathise with the disciples on the Emmaus Road, for the weight of human grief and personal tragedy can often blind us to what is going on around us. Darkness and despair becomes a barrier to seeing. All they had at that point were shattered hopes and dreams. This entry was posted in Sunday Reflections and tagged 3rd Sunday of Easter, Anglican, believing, Catholic, Charles Darwin, Christ, Christian, Darwin, Divine Milieu, Emmaus, evolution, eyes, eyesight, Gospel of Luke, Gospel Reflections, London, Luke, Pierre Teilhard de Chardin, resurrection, Road to Emmaus, seeing, St. Mary's Woodford, St. Mary's Woodford Parish, Sunday Reflections, teilhard, teilhard de chardin, The Divine Milieu, Third Sunday of Easter. Bookmark the permalink. Thanks for sharing this reflection…all of your posts have become key to my daily contemplation. You are too kind. I hope you have a wonderful weekend! A lovely reflection. All too often I forget the people all around me are not necessarily who I think they are and take for granted, they are the heart of Christ. Separately, this is my first exposure to the term divine milieu, and it makes me wonder, given the time frame, if this term was coined around the time Pasteur and Bechamp were arguing about whether it was the germ, or the environment (the milieu). Just curious if de Chardin picked up on this formative debate and adopted some of that language as another bridge with science? Great question on the origin of Teilhard’s term “Divine Milieu”. I am not aware of where Teilhard de Chardin coined the term “Divine Milieu (Teilhard de Chardin’s professional life was after that of Pasteur and Bechamp but it was possible he used that concept). The term is a cornerstone of how Teilhard views God acting in the world (or more specifically how we can fulfill God’s mission in the world).